In the event that Storyboard Pro unexpectedly quits, your project can be restored back to your latest version saved in the local cache. To recover and open the project, click Yes. Storyboard Pro will open the main interface and load the lastest save available in the cache. One the project is recovered, it is important that you “Save” or “Save As” your project before closing the application. 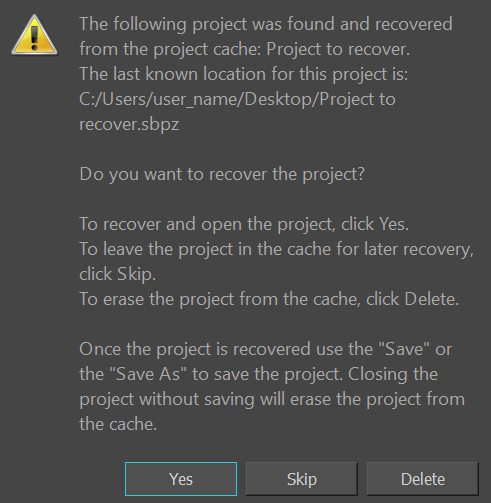 If you don’t want to recover immediately and you want to leave the project in the cache, click Skip. On next launch of Storyboard Pro, you will receive the Project Recovery prompt again. If you will never want to recover the project, you can delete the cache by clicking Delete. This operation is irreversible and the cache will be cleared. IMPORTANT Use Skip and Delete only if you know what you are doing. If you hesitate, it is recommended to proceed to the recovery by clicking Yes and use “Save As” command to restore the project to a new location. NOTE Storyboard Pro proposes to recover only one project at a time. So if more than one projects are in the cache, more than one launch of Storyboard Pro will be necessary to recovert them all.